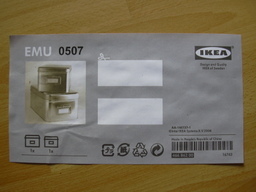 Article number EMU0507 or EMU0518 - tin plated steel box, 2 pieces one inside the other. 9.90CHF in Zurich. 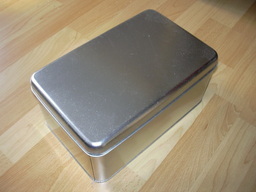 Size of a shoebox, suitable thickness. 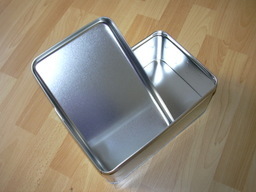 You can make many boxes if you buy one. Ferona Praha Holesovice, U Pergamenky 11, Praha 7. They have aluminium, copper and unplated steel. You have to take at least 1x1m square. Dynamo Metallwerkstatt Zurich has a limited assortment of various steel and aluminium plates. You can cut on a guillotine or with plasma and bend on a bending machine. Contact, support: Clock on the Internet Relay Chat.© 1998-2016 Karel ‘Clock’ Kulhavý et al..